I never loved Brussels sprouts until a few years ago. Now, I can’t stop trying new recipes for them. When my favorite wine (Centine) tweeted a Brussels sprouts recipe as part of this three-course meal from celebrity chef Bryan Voltaggio, I thought they sounded good. But I was wrong: They were absolutely phenomenal! 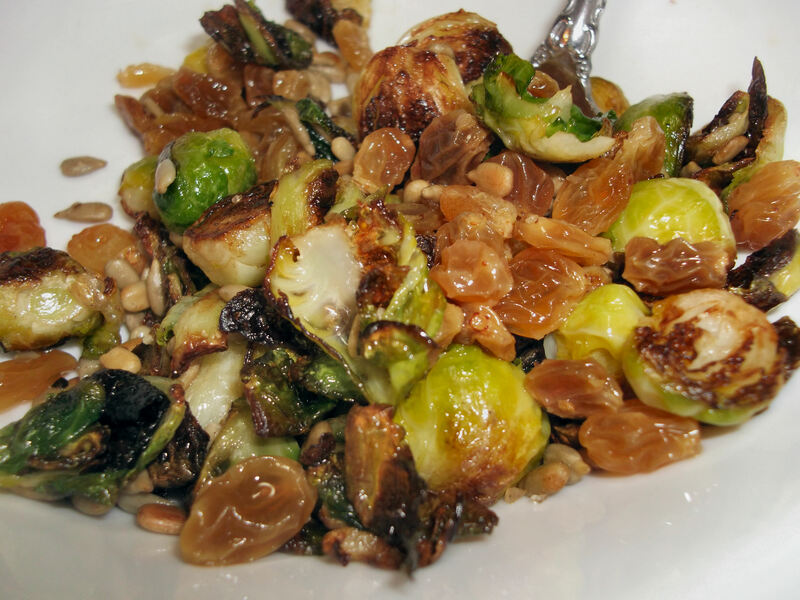 Sunflower seeds provided an unexpected crunchy texture, and the sweet-and-tangy raisins balanced the hearty flavor of the sprouts. I modified his recipe only slightly and will return to it again and again. I hope you will, too. – I strongly encourage you to make and use the pimentón oil mentioned in this recipe, but if you’re short on time, go ahead and use regular cooking oil or ghee. Then be sure make some pimentón oil for next time! – Using a cast-iron pan will give you the best results, but if you don’t have one, go ahead and make them in any other pan. Just make them. Soon. 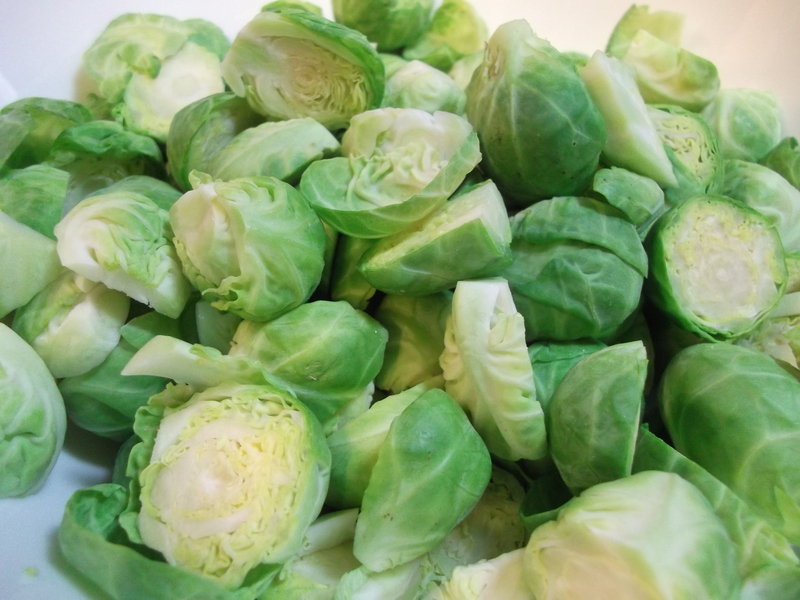 Thoroughly wash the Brussels sprouts to remove any dirt, and remove any loose outer leaves. Spin dry in a salad spinner or pat dry with paper towels. Cut off the hard stem and slice each sprout in half. If you don’t have a lid that fits (or mostly fits) the pan, fold a sheet of aluminum foil over the edges of the pan to make a lid; set aside. Pour the pimentón oil into the pan and place the sprouts cut-side down in the oil. Keep them in a single layer and don’t pack them in: Overcrowding the pan will steam the Brussels sprouts instead of crisping them up. Season with salt and cover with a lid (or the aluminum foil lid). Cook over medium heat for 10 to 12 minutes, then check the sprouts for color. When most are lightly browned, stir in the sunflower seeds and gently mix them in. It’s okay if some sprouts flip over in this process. Continue cooking until the seeds are lightly toasted and the sprouts are nicely browned, fully cooked and crispy. Stir in the raisin pickles (recipe below), mix well to combine, and serve. Combine all ingredients and microwave for two minutes; let cool to infuse. After washing and drying the sprouts, trim the stem ends and slice each sprout in half. Pour the pimentón oil into the pan and place the sprouts cut-side down in the oil. 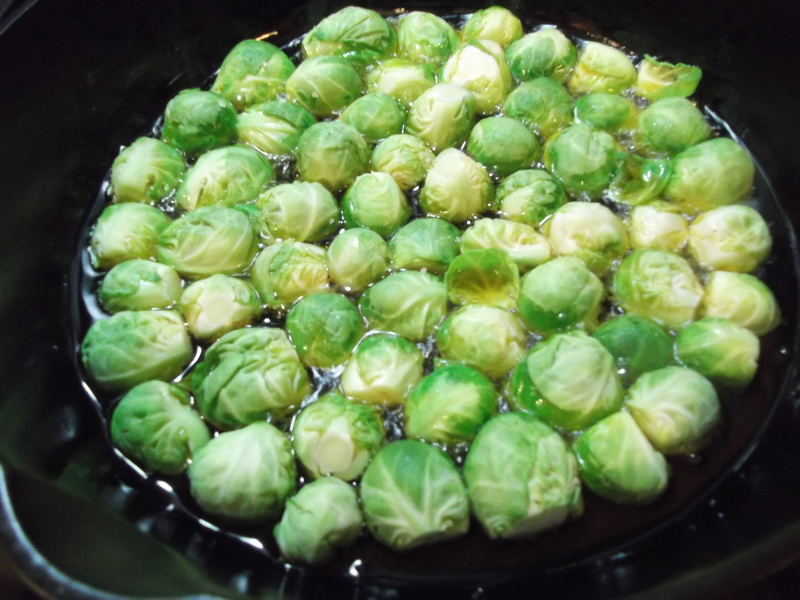 Keep them in a single layer and don’t pack them in super tight: Overcrowding the pan will steam the Brussels sprouts instead of crisping them up. Season with salt and cover pan with a lid (or the aluminum foil lid). The first time I made these, I used the aluminum foil lid and didn’t check the sprouts early enough: they became blackened, and not in a very tasty way. The next time, I used a glass lid so I could monitor their progress; as ill-fitting as this lid was, it worked just fine. 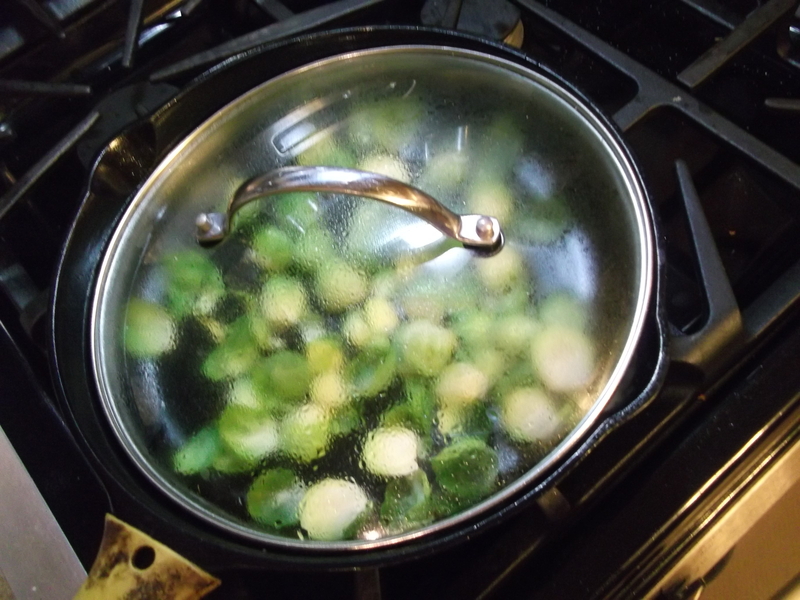 Cook the sprouts over medium heat for 10 to 12 minutes. While they are cooking, make the raisin pickles (recipe below) by combining all the ingredients in a microwave-safe bowl. Heat on High for two minutes and then let the mixture sit. The flavors will infuse and the raisins will absorb some of the water. After about 10 minutes, check the sprouts for color. When most are lightly browned, stir in the sunflower seeds and gently mix them in. It’s okay if some sprouts flip over in this process. Continue cooking until the seeds are lightly toasted and the sprouts are nicely browned, fully cooked and crispy. 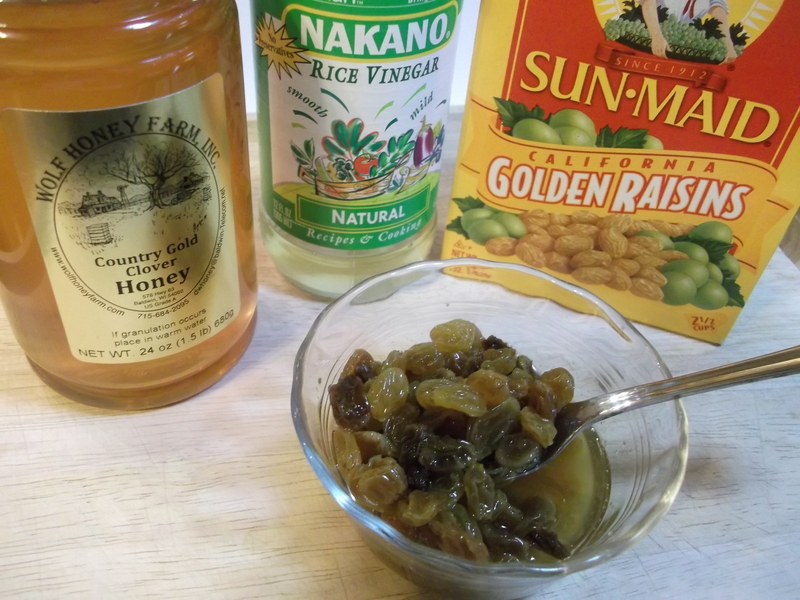 Stir in the raisin pickles (recipe below), mix well to combine, and serve. Enjoy!